If you went to college or have worked at one, you may know that bed bugs is a not so uncommon issue that pops up in dorms. When this happens, the room that is infected needs to bag EVERYTHING. As well as, the rooms directly above, below and to the sides of the room. Yes, that is now approximately eight residents inconvenienced by two people's misfortune. Usually these approximately eight residents are not happy campers, but surprisingly some just are glad for the precaution. Here is where my idea for a marketing strategy lies. There is a company called GIANT microbes by Drew Oliver (my client Palooza Toys sells them *wink* let me know if you're interested). He makes the things we cringe about into little plush toys we love. I had E-Coli in my fridge for 2 years straight. It's hilarious. Well... to me it is, but my roommate is now creeped out. Therefore E-Coli stays out of our fridge. But anyway, these toys are something we all wish we had thought of BUT we didn't. 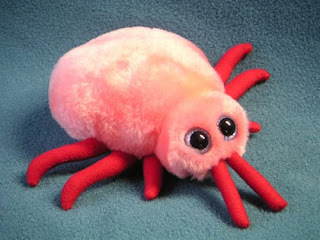 The marketing idea is, what if the Residence Life office that had to give bad news to those approximately eight residents, gave them a bed bug plush toy for their inconvenience? Talk about making light of a sucky situation. Sidenote: I better get a cut if GIANT microbes markets this. Toy Fair 2012 was a nice break from the chaos and high end of fashion. TIA brought some very cool, creative and high tech elements this year. Kudos to them.